Are you looking for whelping box plans? A whelping box, which is also referred to as a nesting box, provides a safe and comfortable place for female dogs to give birth, as well as a location to nurse and nest with her offspring for several weeks following their birth. If your dog will be giving birth to puppies soon, it's important to make sure that you have a whelping box on hand to use for the delivery as well as for the new mother and her litter to nest for about six weeks after the birth. Manufactured whelping boxes are widely available for purchase at pet supply stores and mass merchandise retailers that have large pet care departments, but it's not difficult to build one yourself if you have a good set of plans to use. Whelping boxes do not have to be complicated or fancy. They are simply square, open boxes with flat bottoms and raised sides. The type and size of box you will need depends on breed size. For the largest breeds, such as Great Dane and Great Pyrenees, you will need a whelping box that is about 5 feet X 5 feet with sides that are around 18 inches high. For medium breeds, whelping boxes are typically 4 feet X 4 feet with sides approximately one foot high. Smaller sizes are sufficient for small and toy breeds. When deciding which size whelping box you need, consider the fact that the area of the box should be sufficient to comfortably accommodate a nursing mama dog and her full litter of puppies for the first six weeks of their lives. The sides of the box should be tall enough to keep the puppies from climbing or falling out. There should be a dip on one side of the box to make it easy for the mother dog to freely move in and out of the box. Gather all of your supplies together before beginning the project to reduce the amount of time wasted between steps. If you do not own a circular saw, there are additional options available. Most home improvement stores such as Lowe's or Home Depot rent equipment. Typically rentals are either four hours, which is considered a half day, or for the full day. Another option is to have the plywood and lumber cut at the store. Often both stores will provide the first two cuts for free and additional cuts are a nominal fee. If you choose to have the wood cut at the store, make sure you have the measurements with you because the stores only will provide cuts at the time of purchase. Measure and cut the wood into required lengths. 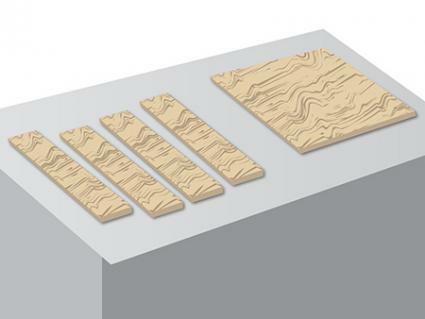 The plywood should initially be cut in half so there are two pieces that measure four by four foot square. Set one aside for the bottom of the whelping box. The other half should be cut into four pieces that measure one by four feet each. These will be the sides of the box. It is important to have sides low enough for the mother to be able to get out when needed but high enough for the puppies to remain inside. For small breed dogs, you may opt for lower sides by cutting the pieces in half again so they measure six inches by four feet each. Discard the extra pieces or reserve them for another project. One piece of lumber should be cut in half so each piece measures four feet in length. Cut two lengths from the other piece of lumber that measure three feet, eight inches in length and discard the small leftover piece. These four pieces will form a square for the plywood bottom to rest upon. Once the pieces are cut, sand any rough edges so the pieces will fit securely together. Lay them flat on a drop cloth or newspapers, then stain if desired. Once the stain has completely dried, follow up with a coat of polyurethane to waterproof. If you choose not to stain the whelping box, you should still apply the polyurethane because it helps protect the whelping box from the elements if the box will be outside. Assemble the box by first attaching the lumber to the bottom of the plywood base with the two and one-half-inch long wood screws. Each lumber piece should be placed on the plywood so it is flush to the edge. 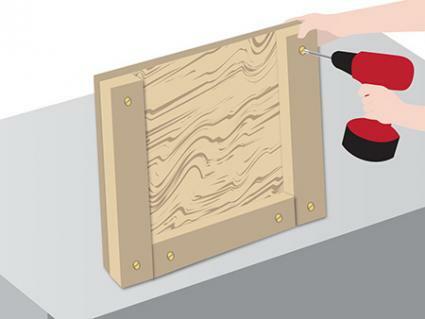 Attach to the plywood by drilling two screws on each end of the lumber so it is firmly secured. Start with one, four foot length and attach. One of the shorter pieces should be attached next at a 90 degree angle. The third piece should be the other four foot length which is placed parallel from the first four foot length then the final piece drilled into place in the remaining spot. The result should be a square frame. Flip the the plywood over and attach each of the sides using the one inch screws. For sides over six inches, place screws at three-inch intervals to insure the sides will remain sturdy. For sides six inches or shorter, a screw at the bottom and the top are sufficient. McEmn Mark III Whelping Box - Visit this website to find detailed instructions for building a whelping box large enough to accommodate a litter of Great Dane puppies. 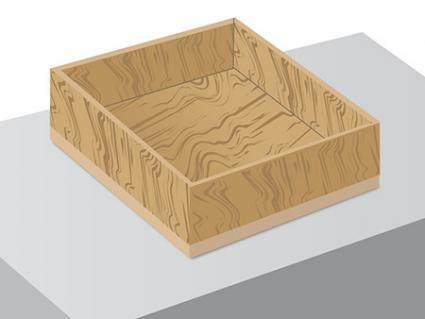 You can make proportional adjustments to the dimensions provided if you would like to construct a smaller box. K-Nine Dobermans - At this site, you will find detailed instructions for building a whelping box large enough to accommodate a litter of Doberman Pinscher puppies. You'll find plan drawings, written directions and photographs of each step of construction as well as the finished product on this link. 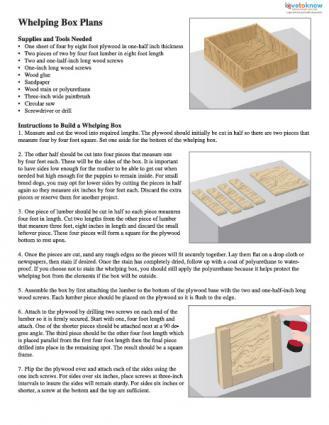 Dee's Whelping Box - This site provides specific instructions for constructing a whelping box. The instructions are provided in narrative format accompanied by figures with visual representations of each step. If you decide that constructing a whelping box is a do-it-yourself project that you would rather not tackle, there are alternatives. You can purchase a pre-made whelping box or adapt another type of product for this purpose. For example, the bottom portion of a fiberglass dog crate may be used as a whelping box for medium dogs or small dog breeds. For large dogs, some people use shallow plastic wading pools.